A supply chain performance management system consists of three blocks: External metrics, internal financial metrics, and internal non-financial metrics. In traditional systems, all of them are cost-centric and thus contributing to silo-optimization. To internally manage the supply chain, cost-centric metrics must be replaced by flow-centric metrics that aim for overall system optimization, whereas external metrics remain unchanged as they are dependent on legal regulations. In my last blog posts, I introduced you to the world of Flow Metrics: Metrics that consequently support the flow of relevant information and materials in the organization- to drive all benefits concerning service, revenue, inventory, expenses and cash. The one and only way to avoid silo-optimization and achieve overall business goals. Relevant ranges: Define metrics providing information that is relevant for the appropriate time frame (operational, tactical and strategical). No contradictions: Use metrics that support common strategic objectives and whose hierarchy provides resolution of conflicts. System-based instead of silo-based mindset: Identify the right rules to promote flow and hence overall system optimization promoting a mindset to serve customers and jointly succeed against the competition. Manage impact of outliers: Identify the optimal value range for a flow metric and eliminate outliers. Focus on flow: Instead of focusing on margin maximization by lowering unit costs, flow should be increased by focusing on relevant information and material according to actual customer demand, which automatically results in quality and service improvements. Quality before quantity: Instead of running larger batches, raising order minimums and extending the forecast to improve overall efficiency effectiveness (OEE), the focus should be on quality and lead times, lower MOQs and increasing throughput of bottleneck resources. Inventory as buffer: Inventory requirements need to be calculated as buffer for variability in supply and demand instead of imposing inventory values and mandating general reductions. Continuous improvement: Identify the largest source of variation instead of opportunities for unit cost reduction. 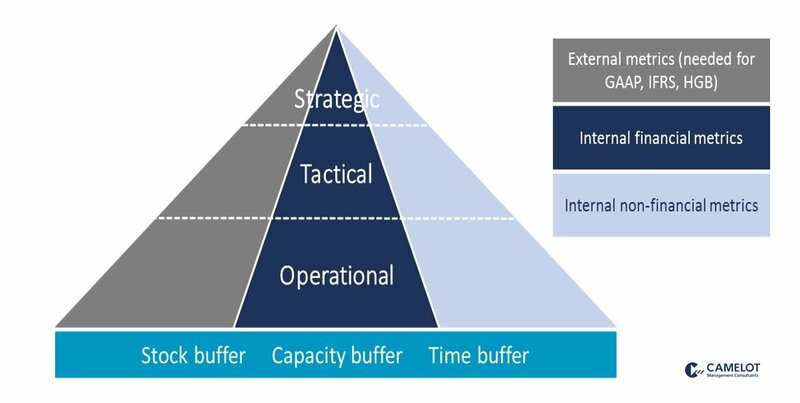 The CAMELOT Flow Metrics Framework covers the three relevant time ranges (operational, tactical and strategic) for internal as well as external addressees. Furthermore, all relevant buffer types that protect and control the flow of material within the Demand-Driven Material Requirements Planning (DDMRP) are considered to provide a holistic view on supply chain performance (Fig. 1). When defining Flow Metrics that protect and control the DDMRP stock, capacity, and time buffer, the performance management has the challenge to align and connect operational and management level. Each metric must be designed in accordance with its relevant range (strategic, tactical, operational) and support (or at least not influence) other ranges. Prerequisite of a successful implementation of a non-conflicting end-to-end performance measurement and management driving overall company success is that the principle of flow if fully integrated in all areas and levels of the organization: The flow-based supply chain performance management must consider organizational, cultural, technical and process aspects. The implementation requires full support and comprehensiveness of all departments and in all levels of decision making – within the operational, the tactical as well as the strategic range. 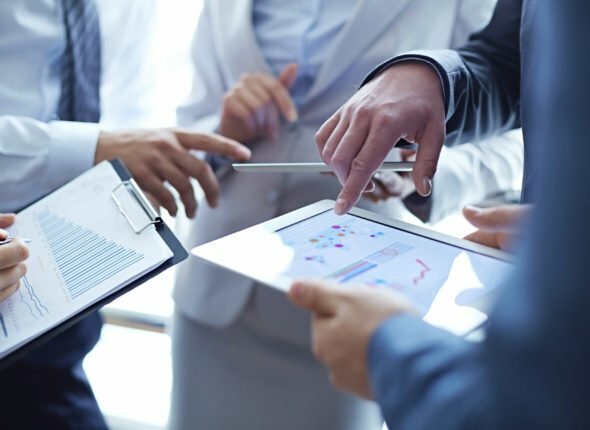 Besides organizational and cultural alignment, data, IT systems, processes and workflows need to be touched. These touchpoints are described within the Flow Metrics Building Blocks which will be the topic of my next blog post.